In this article, we'll examine in more details the cause of falling and why you lose balance as you age. You can determine how good your balance is by measuring the length of time that you can stand on one leg. The following table shows the average balance time by age group in a study conducted at a Japanese health institute. If your balance time is below average, then you'll have higher risk of falls, or slipping and tripping accidents. In the above study, women tend to lose their balance more than men but only by a small margin (1-2%). From this study, it is also evident that there's a sudden significant decrease in the ability to maintain balance among middle-aged people (40 years and above). Please take note that the numbers stated above are only average. There are people who were able to maintain balance much longer, and there are also those who were only able to maintain their balance at much shorter time regardless of age and gender. The reason why they vary is explained further below. The skins all throughout your body have significant amount of tiny pressure sensors or mechanoreceptors. Some areas have few pressure sensors, while other areas have thousands, like on the soles of your feet. The pressure sensors on the foot soles provide information to your brain to help balance your body. As you get older, the sensors will get weaker and your foot sole lose sensitivity. But there are also other factors that can lead to weaker pressure sensors. In our study, people are almost twice as likely to be in a fall accident caused by poor blood circulation. This can be simulated by soaking your feet into ice cold water for about 3 minutes. Because of the cold temperature, the pressure sensors on the foot sole begin to lose sensitivity. If your forward-moving foot hit something, your body will be off-balance causing you to fall or trip. Well, it's a matter of common sense to always have your eyes on path and watch where you are going. Remember the old adages - "Prevention is better than cure", "An ounce of prevention is worth a pound of cure", "Look before you leap", etc.? But that's not the only problem. Here are the other two major reasons why you stumble while walking. 1. Your forward-moving foot is pointed down. If your foot is pointed down while making a step, then you are more prone to falling. 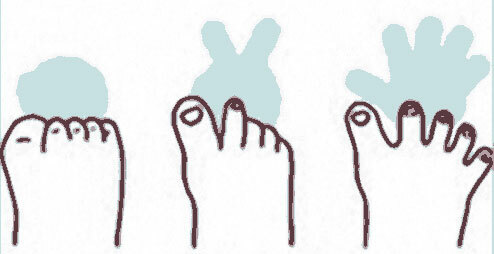 To avoid this, your forefoot or toes should be flexed upwards as shown on the image below. 2. You walk like a pendulum. The height of your step can greatly increase your risk of falling. 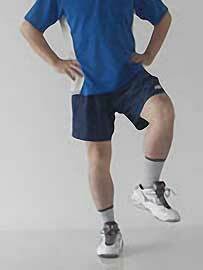 To prevent this, your forward-moving foot must be higher off the ground (at least 5 cm) while the knee is raised high as shown on the image below. 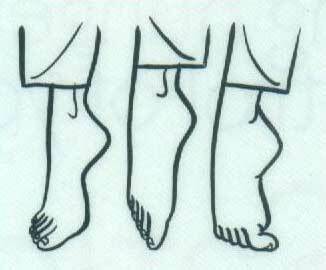 When this information is not transmitted well to your brain, which happens as you get older, then the movement will get weak or ineffective making it hard for you to maintain your foot higher off the ground. There are a lot of things in your house that can contribute to clutters that can cause you to trip or fall. Always make sure to put away or store properly all personal belongings and other unnecessary things even if it is only a newspaper, remote control, and laundries scattered on the floor or carpet. You might think that your feet do not need exercise or stretching compared to other parts of your body, but in reality, feet stretching exercise can really help your feet maintain balance. Cold muscles and pressure sensors work less well and are less responsive to signals. A decreased temperature will also cause your muscles to have less strength and less flexible, which can lead to accidents.